Epson's UltraChrome XD inks are pigment-based inks designed to produce vibrant and rich prints, no matter what type of media used. The inks offer some water resistance, and are generally less prone to smudging and fading. These qualities make them ideally suited to projects involving archival and short-term outdoor applications. Epson's PrecisionCore TFP Print Head offers high performance and consistent results for accurate plotting. It can produce line widths as thin as 0.018mm, resulting in high-precision line detail. 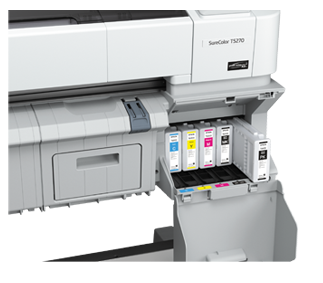 The print head also has variable size ink droplet technology, allowing it to produce high quality photographic prints. With a maximum resolution of 2880 x 1440 dpi, sharp text and fine detail are easy to produce.